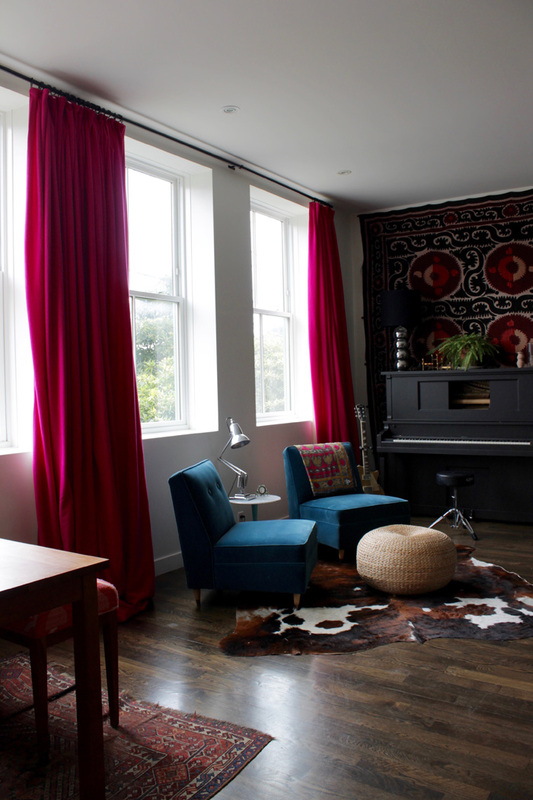 The Shingled House: Wool Curtains! Finally! I finished the wool curtains for the front of the house. Let me just say,this project took diligence. First there was getting the wool in the right color, and then sewing these puppies was no small feat due to their enormous size. This job consisted of four individual panels -each 108" wide and 118" long, finished. I have four enormous windows but instead of draping on both sides of each window, I have one panel for each window and wall area and double up in the center, that way each column of drape is nice and full while at the same time saving me the economics and trouble of an additional 4 panels. 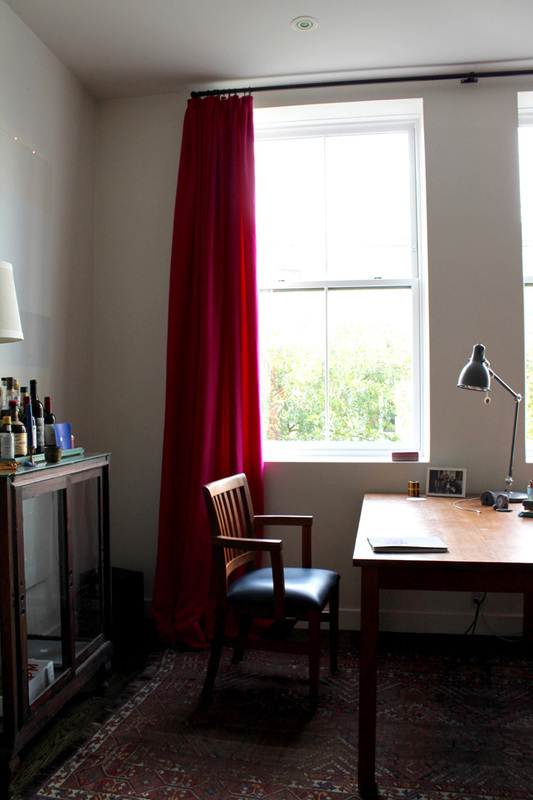 Beyond that, the interior architecture of my house is very minimal -the windows are quite striking the way they are set into the wall with minimal trim, so to have too much curtain fluff going on around them would work against that, I think. 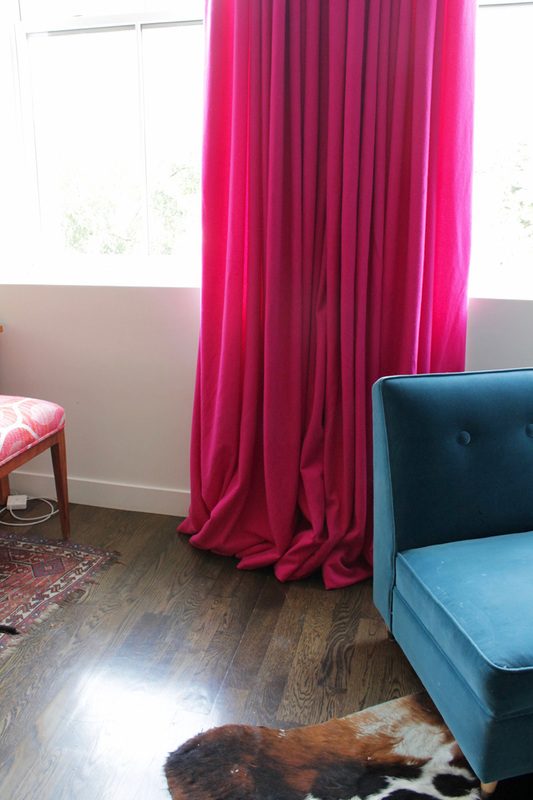 Unlike their silk predecessors, these curtains do not have interfacing -they are only lined. I opted to only line and not interface because there was already so much heft to the wool that I worried that adding interfacing would make them too heavy and that I wouldn't be able to get a nice delicate pleat. At any rate, I'm not even sure that interfacing would give much body to a wool curtain based on the way mine drape. The first step after getting the wool back from the dyers was to join the lengths -two per panel (each 55" wide combined to 110" less the seam). I had already done all the calculating and cutting for the lengths because of the dying process, so this was relatively straight forward. First I ironed the two pieces to be joined and then pinned them right-side facing each other. Because this wool has some give to it, I was zealous with the pinning -like 1 pin per inch and a half. Because I was sewing such enormous lengths, I invested in a walking foot for my machine. And when I say "invest", I'm not joking. 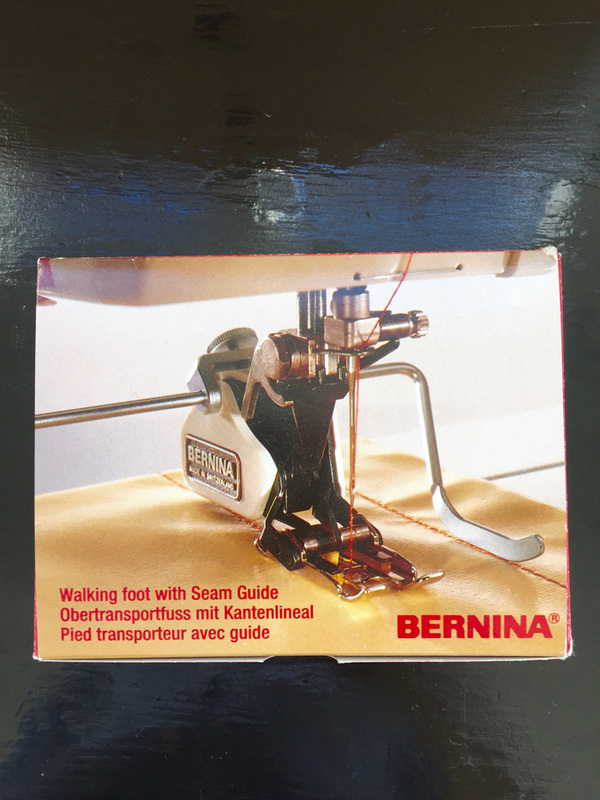 I bought my brand new Bernina foot with an old style attachment (because I have a vintage machine) for $229 on ebay. A walking foot chunks the fabric through the machine on the top of the fabric in the same way the feed dogs under the fabric do -so that the two move together. This helps prevent stretching and misalignment and puckering. I am very glad I bought this foot -I had no trouble sewing these lengths at all. After sewing together the 8 lengths to make 4 panels I did the same with the lining. I had considered recycling the lining from the old curtains but ultimately bagged this preposterous idea because it was much, much easier to just buy some new, uncut fabric. 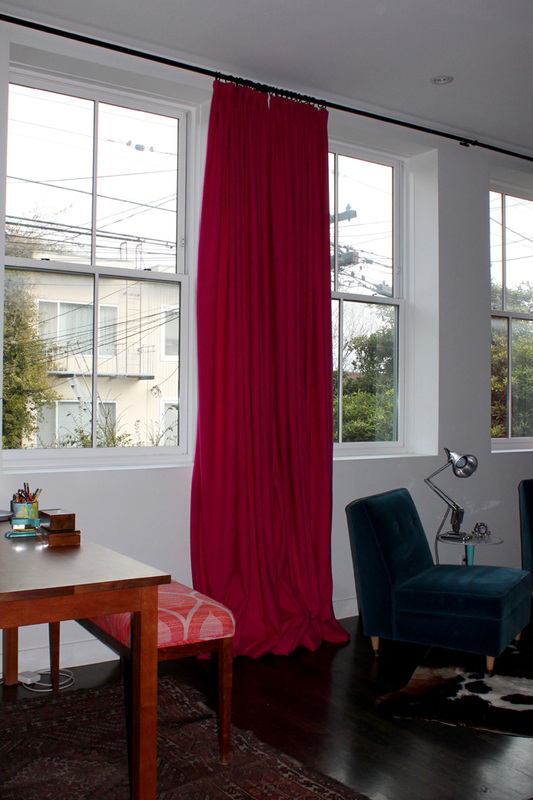 And apparently curtain lining is pretty affordable because I got all of mine for $90 (at Discount Fabrics). 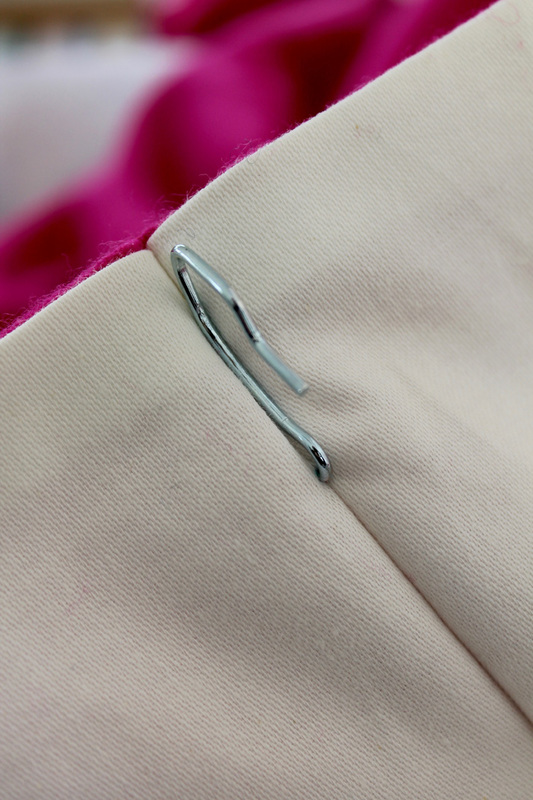 I repeated the same process of pinning and sewing two lengths together with the lining. 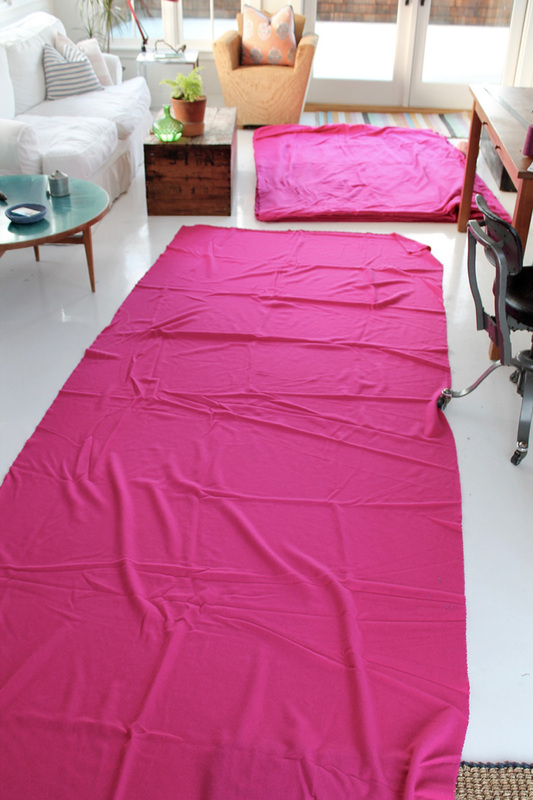 Now would be the right time to address some of the trickier aspects of making really large curtains. First of all, there is a ton of fabric to contend with. This necessitates working on the floor in a large open space. 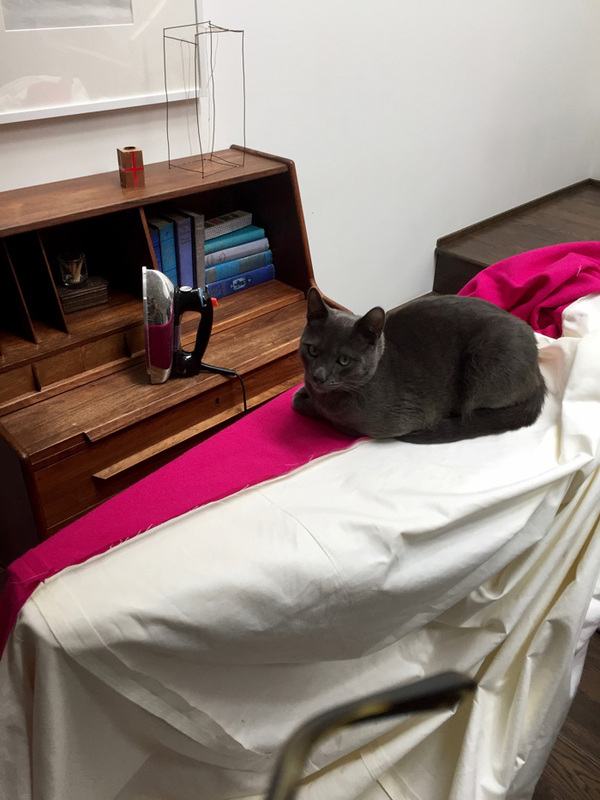 Professional curtain makers work on a large lightly padded table, which allows them to iron, measure and pin without the fabric moving around. I did a lot of my ironing on my dinky little ironing board, this was a pain. I also ironed on the floor when the situation called for it. Also as I mentioned earlier, wool has some stretch to it. That makes it a bit trickier to lay out, cut and pin. I dealt with these factors by being really meticulous. I made sure that my center seams on the lining and fabric were actually centered, so that I could use them to align and square things when I sewed the wool to the lining. I used a large square to mark off my cut lines, pinned the crap out of everything that was being sewn and just worked very slowly and carefully. Finally, these curtains pool on the ground. Pooling will not save a horrible job but it does allow a bit of forgiveness in hemming. As is the case with many projects where I am still learning, I relied on Youtube videos to help guide me along. For general construction technique and methods, this youtube channel has great tutorials; for sewing the lining, this one; for figuring out the pleats, this one. 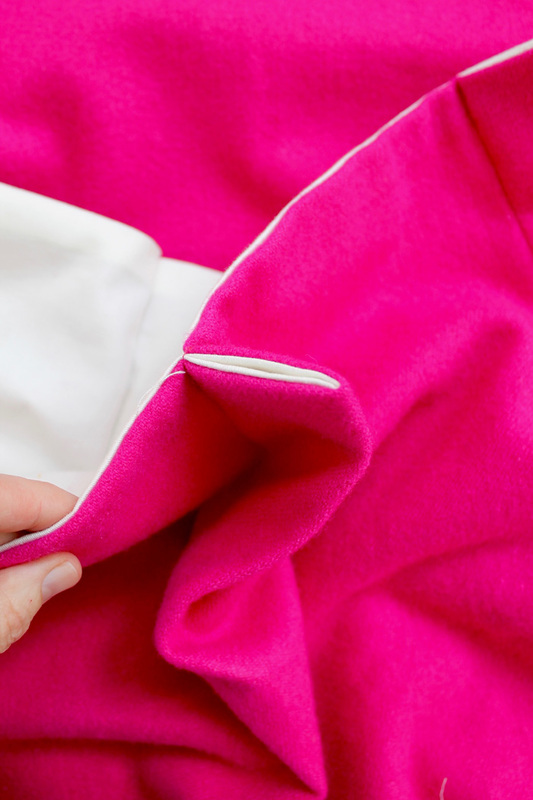 There are a variety of methods for sewing the lining to the fabric. I opted for sewing an invisible seam with a return. This simply means that the lining is cut narrower than the curtain fabric, which causes the side seam to be pulled around to the rear. It is a very neat way to seam the lining to the fabric. The panels are pinned right side together and sewn, pressed and then the top is sewn -starting in the middle -(Watch this video to to make this garbled description much more clear). After the sides and top were sewn, I cut the fabric and lining to their right lengths and then sewed the bottom seam with a hand sewn blind stitch. I used a 5 inch hem folded over twice (so a 10" fabric allowance for seam). Because I didn't want to see any stitching on the front of the curtain, I stitched only through the lining. 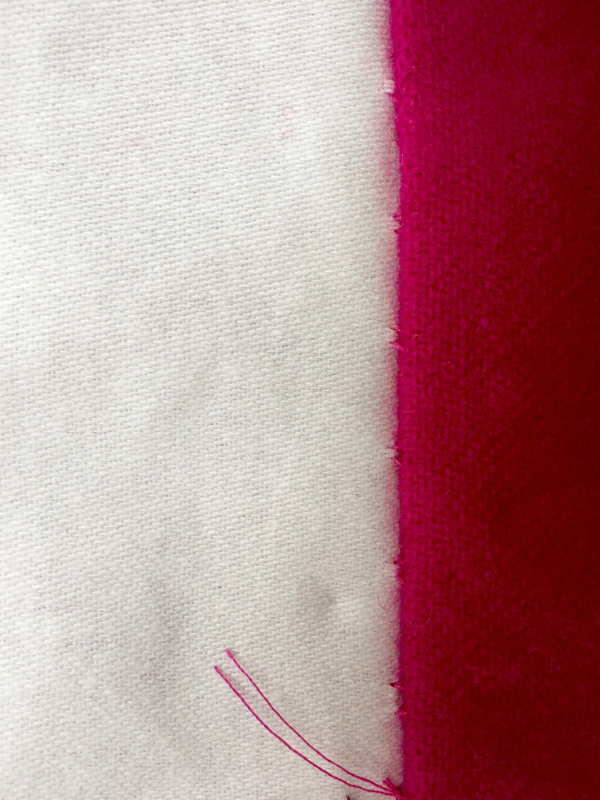 A hand sewn blind stitch is far faster and easier than one might think. 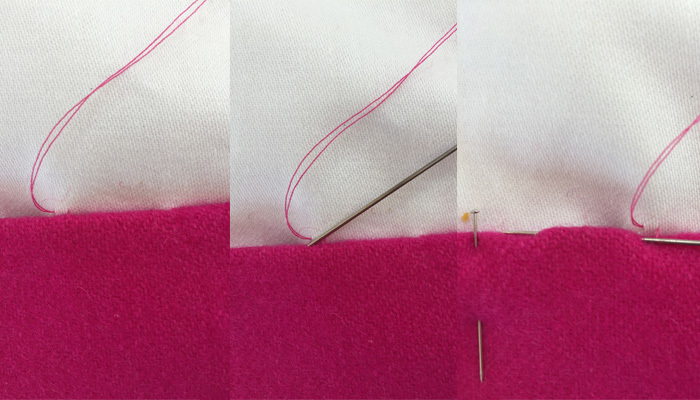 1)Pick up a little stitch on the lining, 2)poke into the fold of the seam, 3)travel about 1/2 inch inside the seam and then poke out, 4)repeat. It's really pretty zen to sew like this. After I did about 6,000 calculations, I determined that I would have 10 pleats per panel spaced 7 inches apart, and that my pleats would use 4 inches of fabric and have a equal return and overlap on each end of 2 1/4 inches. 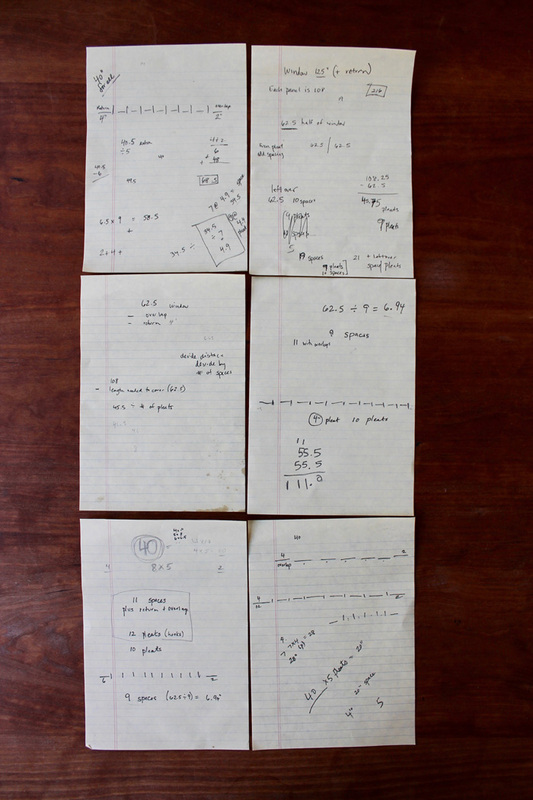 I found that it was helpful to mark out the the spaces and pleats with pins while calculating the formula -because a mock up speaks a thousand words. 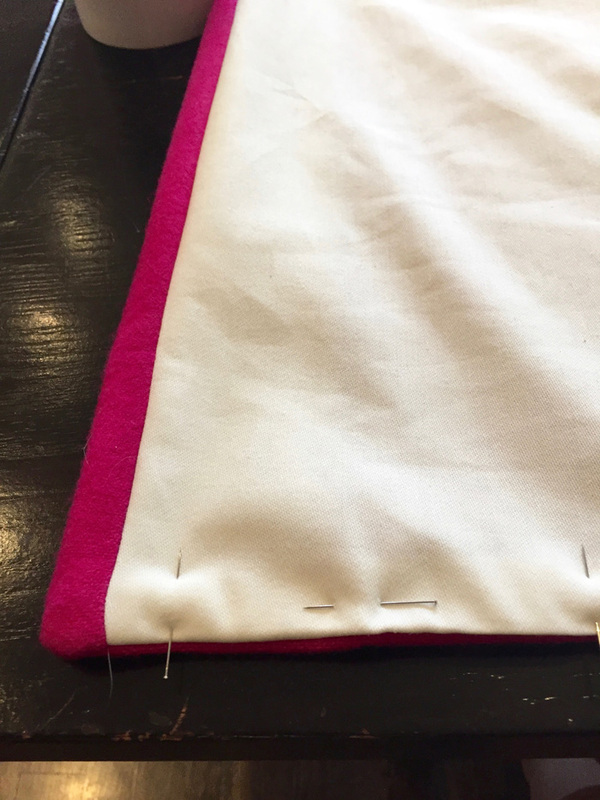 Once the calculations are set, it is safest to mark the layout on all the panels with pins (and not rely solely on measuring as one goes) and use a method to mark which is which, then there are no ugly surprises when sewing. This is the beginning of a pleat. It is the 4 inch pleat allowance pressed in half and sewn with a 4 inch vertical seam. I did not use either buckram or a large seam at the top of my curtains, which is the traditional technique, because it created too much volume to get a nice looking pleat. Instead I have no fold over at the top. Basically I just folded and chalked a 4 inch sew line, and double sewed that. 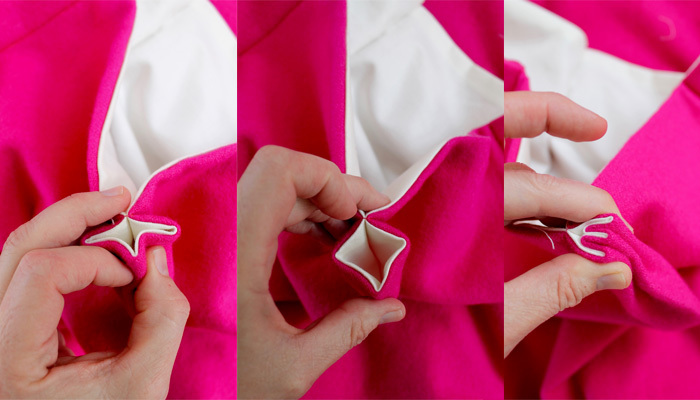 This is how to fold the first sewn pleated section into a triple pleat. 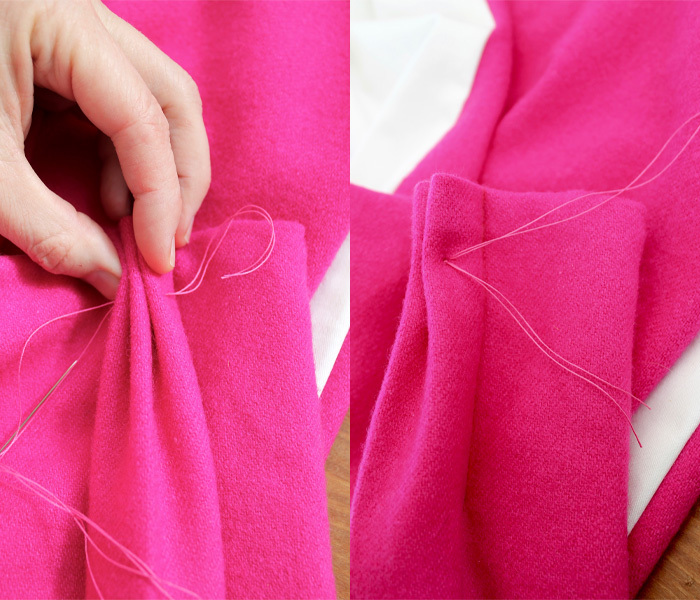 Hand sew these pleats at a single point. I sew mine 1 inch from the top and about a quarter inch in from the edge because I prefer a subtle pleat. Tacking farther down the pleat would make the pleat more pronounced. Don't fret, this is also a pretty fast process. I use a slightly stronger thread when hand sewing the pleat together. 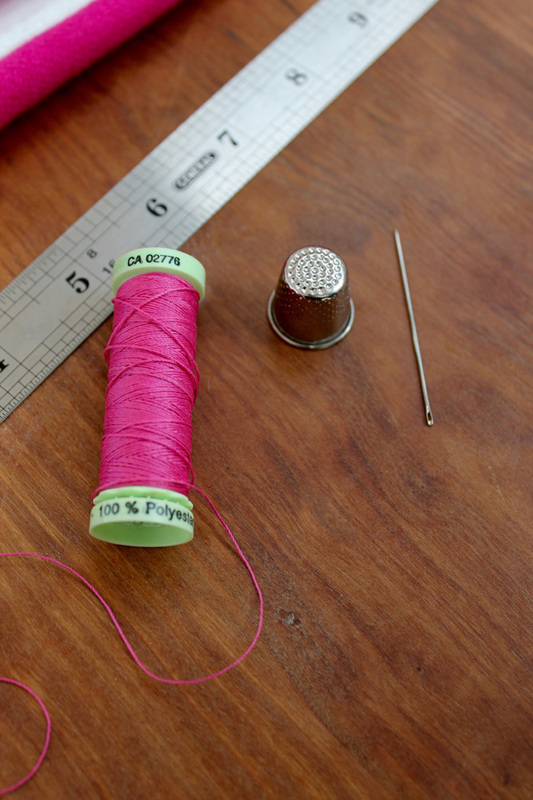 This is the same type of thread used to sew buttons. To hang, I use standard hooks. Some people pierce the fabric to either side of the pleat stitching but I opt to go in right on the stitch and have the hook travel up the inside of the pleat. 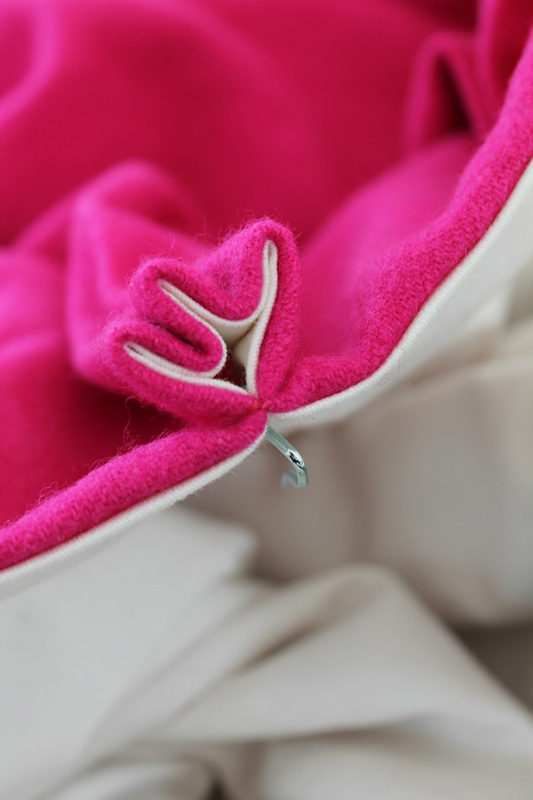 It is for this reason that I double sew this seam, so that this stitching isn't weakened by the piercing there. This scenario pretty much never happens but I thought I should also photograph these closed. If I were to be super critical, I'd think maybe a slightly larger overlap on the ends would be better to prevent any light seeping in at the top there by the hooks, although perhaps the brackets would cause that in any case, I don't know. 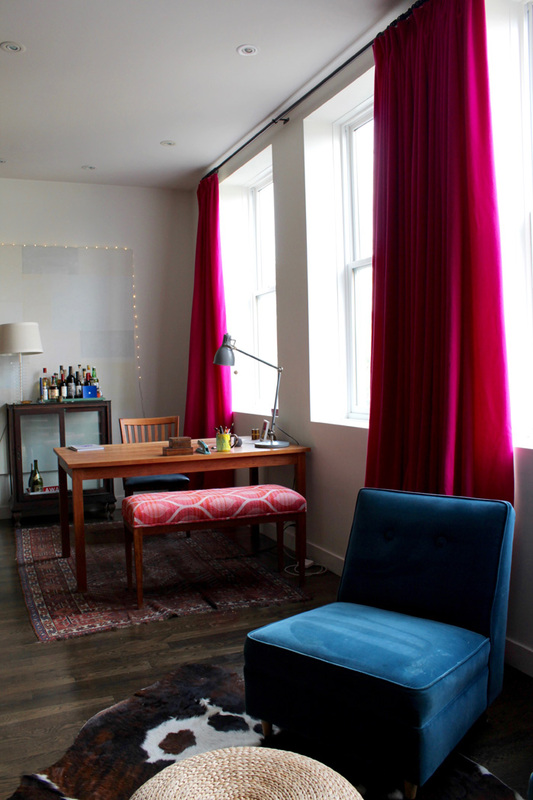 This has been a beast of a post but I wanted to add some final comments on the look of these curtains versus their original silk counterparts -in other words silk vs. wool for curtains. I loved the original silk drapes, they were really vibrant and pretty. The silk had a beautiful sheen, and the curtains hung with a poofy elegance -sort of like a big 80s wedding gown. They were decidedly more formal. The biggest downside to the silk was that they were pretty fragile in the end -both to the sun and the cat. They were also pretty stained from greasy little hands (what a fantastic place in which to hide and play). The wool also drapes beautifully, but is less poofy and is more matte in sheen. This makes them read as slightly less vibrant, even though the color is virtually identical. The texture though, with the slight nap, is more inviting than the silk. It says, go ahead and touch me. Also it reads "warmer" than the silk, I think because of the texture and sheen. They also puddle beautifully at the floor. The wool is formal but in a more minimalist language. I feel the wool will be more durable than the silk, but we shall see. 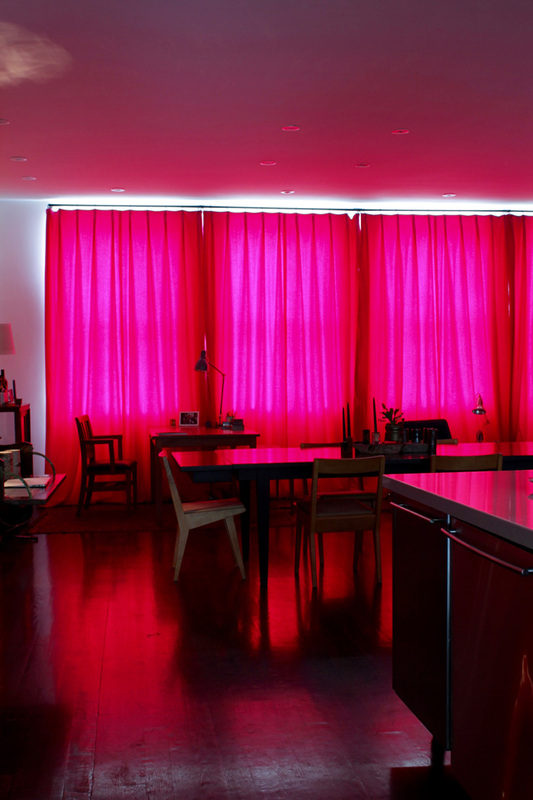 To summarize in another way, the wool curtain is Jil Sander to the silk's Oscar de la Renta. Both elegant, and regal but for different reasons. My decor and architecture is probably better suited to the wool, I realize, now that they are hung so I'm happy with the change I made.